Last Saturday morning we had snow. It wasn’t deep, it didn’t really cause much disruption to the local traffic, but it was white, it was ankle deep and it was cold. Just how I like women to be, sometimes. Doyle burst into the shop, as he usually does, but today he seemed a bit more frantic than usual. Frantic and joyous, which is a bit of a weird combo for Doyle, but we have to take him as we find him, or he finds us, and if we weren’t lost in the first place then we don’t need to be found and it all gets quite unnecessary and pointless. He’d seen an owl, was the cause of his excitement; he’d seen a flock of seagulls and pigeons doing an action replay of a possible scene in The Birds, where they all circle in a raucous vortex before swooping down en masse and doing a bit of damage to the locality and its unsuspecting inhabitants. But they weren’t circling as a preparation for maiming and pecking, they were raising the alarm due to the presence of a predator in their midst. And Hitchcock was nowhere to be seen, so a lot of the symbolism was purely accidental. He dragged me out to see the bird. It was a young healthy looking long eared owl, perched on the side gutter of the building wherein dwells the local dance studio. They do jazz, tap, ballroom, street, samba, tango and line. Versatile hardly begins to describe those girls and their flexibility. We climbed the wooden staircase to the decking balcony leading to the door of the flat above the ex-estate agent’s office. 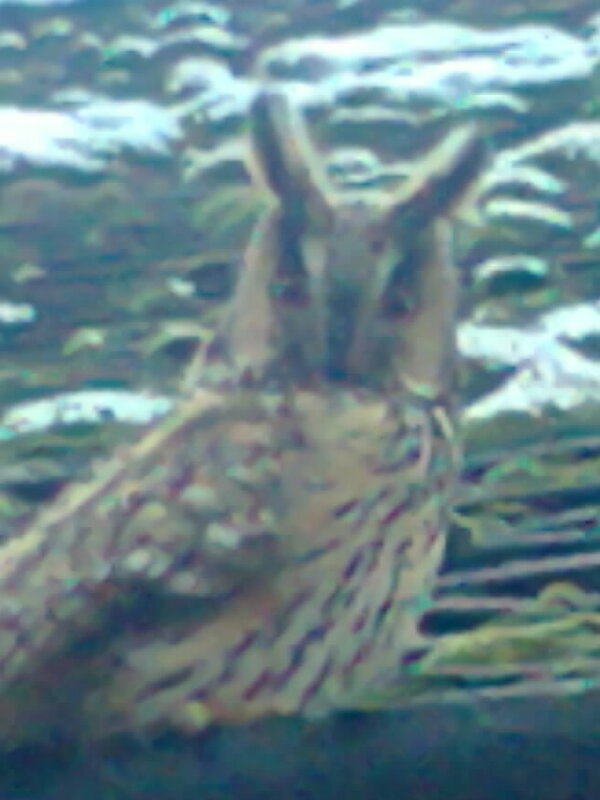 We were but five feet away from the owl, which continued to gaze inscrutably at us. Me and Doyle, we agreed that it was a treat and an honour to be where we were. We’re like that, me and Doyle. Easily pleased. The bird stayed a couple of hours, before flying off in a direction best described as south by south west, or ‘towards some trees near the old congregational chapel’ as I later put it to Kenny. Kenny’s late mum used to live in the flat which led out onto the balcony where me and Doyle had stood. I used to look forward to my wee chats with Betty when she was alive. She was Scottish you know, and it was mighty brave of her to move to a town like this, where no-one really gives a stuff about who you are or where you came from and why. I do though. Anyway, I was talking to Kenny later in the day, the first time I’d seen him for about seven or eight months, and I told him about the owl. He grasped my hand. He does that. “Did you ever go into my mum’s place?” he asked. I hadn’t. I used to see her in the street, in the supermarket or in my shop, where she was always a very welcome visitor. “It’s just that she was obsessed with owls. She had ornaments, pictures, motifs everywhere. How weird is that?” Kenny looked a little shaken. “How weird indeed, slightly spooky even,” I agreed. She must have come back to see the old place, and watch over us all. Or something. I didn’t have a camera with me. My phone takes crap pictures. But here she is. Betty MacAthena, the Owl on the Dance Studio Roof.